49 While he was still speaking, someone from the ruler’s house came and said, “Your daughter is dead; do not trouble the Teacher any more.” 50 But Jesus on hearing this answered him, “Do not fear; only believe, and she will be well.” 51 And when he came to the house, he allowed no one to enter with him, except Peter and John and James, and the father and mother of the child. 52 And all were weeping and mourning for her, but he said, “Do not weep, for she is not dead but sleeping.” 53 And they laughed at him, knowing that she was dead. 54 But taking her by the hand he called, saying, “Child, arise.” 55 And her spirit returned, and she got up at once. And he directed that something should be given to her to eat. 56 And her parents were amazed, but he charged them to tell no one what had happened. It is often the case that what we think God ought to do right now, God chooses to act on later, while what we would put off, he chooses to handle right away. In a sense the juxtaposition of these two miracles is an exercise in time management, where everything is turned upside down. The critical life-and-death situation must wait for a healing and testimony that could have been done under less testing circumstances. Part of the faith that Jairus is called to exercise not only needed to believe that God could deal with his recently deceased daughter, but also had to rest in the trauma that the seeming delay had created. Ultimately, trusting in God’s care means accepting his timing for events. … The most fundamental lesson in this passage is the combination of characteristics tied to faith. faith should seize the initiative to act in dependence on God and speak about him, yet sometimes it must be patient. In one sense faith is full speed ahead, while in another it is waiting on the Lord. Our lives require a vibrant faith applied to the affairs of life, but it also requires a patient waiting on the Lord, for the Father does know best. Kelli and I put our house on the market last year. 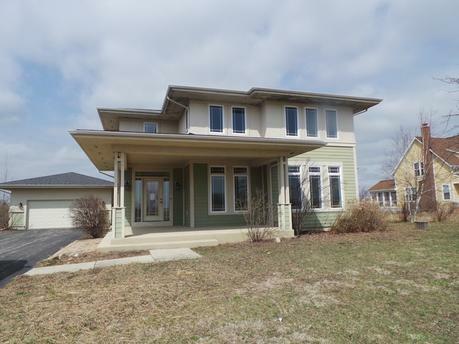 We hoped to sell it in order to move to Grayslake. Grayslake is closer to Moody and it is where Daryl and Amelia will both go to school at Westlake Christian Academy (http://www.westlakechristian.org/ ). We looked around Grayslake and in Prairie Crossing we found the house above. It was in foreclosure and was not likely to come on the market for a long time. Other houses like it came on the market, but without our house selling, we were not positioned to buy it. We took our house off the market last November and I believed that was that. However, Kelli’s strong desire to move has not lessened. The house pictured above has come on the market. Its asking price is about $10,000 more than ours was when ours didn’t sell. The yearly taxes are listed as upward of $12,000. Because Kelli is on a sabbatical and our house is in no condition to show, I have made the decision not to put our on the market. I also like the house in Prairie Crossing but I am content with ours. I don’t drive the children to and from Westlake each day from McHenry. Kelli wants a house where she can entertain families. She says that space is important to her. God has created her in a way where the layout of a house, its architecture and its feel can make her physically ill. She wept as we drove yesterday and said that a life of driving to and from Moody in Chicago, to and from Grayslake for the children, and to and from Trinity to drop me off for my Doctoral Studies feels like a prison sentence. She has believed that the house above would be God’s will for us. She sees it come on the market and she longs for it as God’s solution to the pressures that she is under. So which is it? I am not a prophet and neither am I the son of a prophet. I want to be faithful but I don’t know whether I should plunge into a mortgage that would reset and finish in our seventies, or whether I should play it safe and be glad for the house we have in McHenry. My wife sees an untenable future where we are, but houses in Grayslake cost more than houses in McHenry. Besides, three of the houses on our corner are still for sale. The house next door was bought for $220,000 and is on sale for $110,000. I now live in tension wanting to know whether I am to be patient like Jairus and navigate the pain of seeing my wife unhappy, or whether I am to be impulsive like the woman who touched Jesus cloak and have faith for the finances. My thought is that in such cases we should lay the situation before the Lord. Kelli acknowledged that we are not positioned to put our house on the market while she is writing https://thisoddhouse.org and I am studying at Trinity. However, in the summer she’d like to try and sell our house again. I’d have to let go a dream of going to England in July, but I might then be available to take another doctoral class. The pursuit of Jesus in our day-to-day living is not easy, ask Jairus, and I don’t know what to do. I pray that Jesus would tell me where to walk because I am willing to follow. God, I am willing to follow you wherever you lead. I am willing to move house or to stay where I am. I believe a move could be potentially ruinous unless we downsize, change my mind if that is untrue. I believe that we are in McHenry for a reason, make it clear if we should be in Grayslake. I want to be a man of faith, but I don’t want to presume upon you. How do the woman and Jairus have similar solutions to their problems? How does Jesus’ response affect you? When have people that you have seen had to wait on God or had to act in faith concerning God? How do you know when to act in faith or wait in faith? What would be your solution to a problem where a husband and wife disagree?